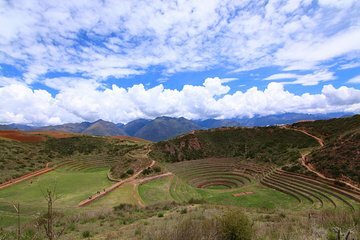 El Valle Sagrado es uno de los destinos más encantadores de Perú y esta excursión de un día completo desde Cuzco incluye los principales yacimientos arqueológicos y caminatas fuera de las zonas más transitadas. Explore el yacimiento arqueológico de Moray, que se cree que fue un laboratorio agrícola, y las piscinas de sal de Maras, que los lugareños aún utilizan. Después de un almuerzo campestre, continúe hasta la parte menos visitada del valle y haga una caminata por los campos andinos hasta una cascada. We had a private tour of the Sacred Valley with Ayni Peru Expedition SAC. Our guide Simon and his driver were professional, helpful and knowledgeable! The tour activities as listed on the Viator website are accurate. One thing to note is to bring cash for the entrance fees to the parks. Luckily, we had the cash but it would have been nice to have been told in advance. The description says to wear comfortable walking shoes but, hiking shoes/boots are a better option. Simon was very knowledgeable and gave us much insight to the Sacred Valley and surrounding areas. It is obvious that Simon loves Peru and his job! I would definitely book this tour again! This was an amazing day! Far exceeded our expectations! Although booked as a small-group tour myself and my sister were the only ones booked so it became a private tour. Our guide, Domingo, from Ayni-Peru Expeditions, arrived right on time. Our transportation was a cab driven by Jorge. The cab was clean and comfortable and Jorge was an excellent and courteous driver who also acted as a second guide along the way. We visited Inca ruins of Moray Terraced Crop Laboratories, Salineras de Maras salt ponds and the Village of Maras. We had lunch with a local family high in the mountains in the small village of Socma then hiked to the beautiful waterfall of Perollniyoc. We made several other stops along the way where Domingo pointed out other ruins, local points of interest, and provided a ton of information about the people and culture of Peru. It was a wonderful day and I would recommend this trip to anyone visiting Peru.